The media’s focus on teen app developers and coders doesn’t tell the full story of young entrepreneurs. Yes, examples like Nick D’Aloisio, who reportedly made $30 million by selling a news summary app called Summly to Yahoo!, do exist. However, despite the handful of successful high-tech and web start-ups, teens are starting low-tech, green, charitable, and science-based enterprises in the US and around the world in far greater numbers. Unbound by the restrictions of the adult mind, young people are doing innovative things – sometimes motivated by the desire to make money or the goal to improve lives. 17-year-old Matthew Kaplan of Phoenix Arizona, started an anti-bullying program, the Be O.N.E. Project for which he received a Disney Award. Several teens in an MIT entrepreneurship program are raising funds for their company, Artisuns -- a platform to female artisans from developing countries sell their hand-made goods. Bella Weems, a teenager from Arizona, US is approaching revenues of over $250 million this year with her own jewelry business, Origami Owl. At 17 years old, Avani Singh of New Delhi, India founded Ummeed – a program that trains women from the slums of Delhi to become electric-powered rickshaw taxi drivers to help support their families. 15-year-old Nicole Ticea from Vancouver, Canada devised an early-stage HIV test that analyzes a pinprick of blood to indicate whether someone has recently been infected with the potentially deadly virus. Andrew Mupuy from Kasokoso, Uganda started his eco-friendly paper bag manufacturing business, Youth Entrepreneurial Link Investments, at age 16 after learning of the environmental hazards of plastic bags; he now employs about 20 people. “I started Origami Owl with $350 and a simple dream in mind—getting a car on my 16th birthday. So, with all of my babysitting money and my family’s support, I set out to start my own business and created Origami Owl,” said Bella Weems whose company will make revenues of about a quarter of a billion USD this year. Carter Kostler, a 15-year-old from Virginia in the US who was featured as a guest on ABC Television’s Shark Tank, had a different motivation for starting his own business. He was concerned about the youth obesity epidemic caused by the consumption of sugary drinks. According to Nkem Modu, the Chief Curator of TeenBusiness.com, “There are so many inspiring stories about teens exploring their hobbies and talents and turning them into businesses. It’s exciting to discover and share their experiences and motivate others.” Much more than providing inspiration for other teens, the site contains a wealth of learning guides and videos. About TeenBusiness.com: TeenBusiness.com is the global resource for teen entrepreneurs, investors, and inventors. Formerly known as TeenVestor.com, it is the first website that covers both youth entrepreneurship and investing through creating and curating essential resources for its growing audience. The Wall Street Journal recommends the site as one of the best sites for teen entrepreneurs. How Teenvestors can use market capitalization to pick stocks. Stocks are categorized in countless ways. Here are the most common categories. Teenvestors should keep these items in mind to avoid being fooled by investment fraudsters. Keeping Them Honest: Why We Should Ask More Questions About The Success of Teen Entrepreneurs, Investors, & Innovators. The quote above related to a December 2014 story of a teenager who allegedly made $72 million in the stock market while still in high school. The story went viral on Facebook, was a front-page story in the New York Post and was featured in Business Insider after being published in New York Magazine. It didn’t take long for the lying teen, Mohammed Islam, to confess to making the whole thing up (See: Confession). As for New York Magazine, it now says: “We were duped. Our fact-checking process was obviously inadequate; we take full responsibility and we should have known better. New York apologizes to our readers. This incident highlights what TeenBusiness.com believes is a big problem when dealing with the claims of TeenVestors: some teen entrepreneurs, investors, and researchers exaggerate claims of success and underplay the amount of assistance they receive from their family members – and journalists are far too willing to believe them. For the record, we have been the biggest cheerleaders of young entrepreneurs and investors. In fact, we wrote the first book on how parents can help their kids become entrepreneurs (The Lemonade Stand: A Guide To Encouraging the Entrepreneur In Your Child – initially published by Bob Adams Inc.) and some of the earliest books on teaching teens to invest (TeenVestor: The Practical Investment Guide for Teens and Their Parents and Mad Cash: A First Timer’s Guide To Investing $30 to $3,000 – Both published by Penguin/Perigee). Over the years, we have researched hundreds of stories about honest TeenVestors and we have marveled at their desire to follow their passions to build a business or achieve some other innovation. Our website, TeenBusiness.com attests to our faith and confidence in today’s youth to help craft solutions to the world’s problems whether through entrepreneurship, research, or other innovative activities. (See news items about TeenVestors on our website). However, experience also tells us that some TeenVestors will exaggerate claims of success and in some cases, will lie outright. This phenomenon is not particularly new. In the 1980’s, one of the first young swindlers produced by our research team was Barry Minkow. By the time he was 16 years old, Barry had already started his own carpet–cleaning business, ZZZZ Best. By age 18, he was a flashy Ferrari–driving millionaire living in a big house in California’s San Fernando Valley. By his twenty–third birthday, he was serving a 25–year sentence in a federal prison for 57 counts of fraud and conspiracy for billing insurance customers for bogus carpet restoration work. What makes this fraud by Barry really remarkable is that he fooled banks and big Wall Street executives alike. He fooled these professionals so much that his company was listed on the NASDAQ stock exchange at one point and had a market value of nearly $300million. (See our blog about Barry Minkow). You may be asking, why does it matter if TeenVestors exaggerate claims of success? Who does it really harm? Outright fraud is not something we want to encourage amongst teen entrepreneurs, investors, and innovators for moral reasons. In addition, a TeenVestor who starts lying and/or exaggerating the level of his or her success at an early age will eventually get into legal trouble when the lies have to get bigger and bigger. While Mohammad Islam and Barry Minkow are blatant examples of fraud among the ranks of TeenVestors, there are other problems we see with other types of claims by some young people. For example, scientific claims by TeenVestors have often not gone through a peer review process by which scientists evaluate the validity of such claims. Science prizes are great but they are often accompanied by media hype that take on a life of their own whether the scientific claims are true or not. Another problem regarding claims of TeenVestors is when they (or those who write about them) ignore the presence of “helping hands” in their journey to success. If, for example, a well-connected parent, helps his son or daughter get products into a major department store, it would be good to reveal that information to other young people who may read a story about the young entrepreneur. Why? Because we don’t want aspiring TeenVestors to easily give up if they don’t quickly reach the same lofty heights other young entrepreneurs seemingly reached effortlessly. In addition, it would be a good thing to demonstrate to aspiring TeenVestors that they too should seek mentors such as adult family members or family friends who can help them achieve success just like other successful young entrepreneurs. When TeenVestors don’t reveal sources of help, it reminds me of students who ace exams and then pretend that they didn’t study or get tutored on the subject. Revealing how they achieved good grades may encourage other students to study harder or seek more help. This would be better than leaving other students feeling that there is something wrong with them as opposed to pushing themselves to do better or finding people who can help them academically. For the record, there is nothing wrong with getting help from family and friends in business. But we want more honesty in the disclosure of how some TeenVestors are making it big in business. The following are things that should be considered with regards the claims of TeenVestors. Is the profit or revenue claim believable? In general, no TeenVestor who is just starting out in business or investing is going to make millions of dollars right off the bat. Did the TeenVestor receive a large amount of financial assistance from family – financial or otherwise; if a TeenVestor is getting thousands of dollars from dad or dad uses any influence he may have with Walmart (for example) to get his son or daughter started, I think other aspiring young entrepreneurs should know this. Is the TeenVestor truly the main individual running the business? If his or her parents are mainly the ones running the business, other aspiring young entrepreneurs should be informed. Has the scientific claim been peer reviewed in any scientific journal? The lack of peer review does not mean that the scientific claim is invalid but it does mean that enthusiasm about such a claim should come with disclaimers. If the TeenVestor has developed an app, did he or she do the coding? There are many people who outsource coding of apps to other people so this is not a bad thing but it should be disclosed. How did the TeenVestor get the business idea or come up with the scientific research? How did the TeenVestor get access to the scientific lab used for experiments? In general, no TeenVestor will be granted access to academic labs without some connection to the facility; once again, there is no crime in having such connections, but it should be disclosed. We would like for all TeenVestors to enjoy the ride of trying their hands at entrepreneurship, investing and finding innovative solutions to life's challenges. We don't think its so important that they show how much money they are making or that they have made a great discovery no one has thought about before. At TeenBusiness.com, we feel that it is enough for them to have the guts to step out of their comfort zone and take a chance at something with no absolute certainty that they will be successful. TeenVestors, in our mind, are already winners no matter what they achieve. No exaggerations of success or hiding sources of success are necessary. Nowadays, some online brokers also offer great mobile apps that last you monitor your account on the go. As our younger readers might have noticed, there aren't many online resources for teenagers and young adults who want to buy stocks (at least not many resources that have been updated within the past 10 years). We are here to help you get started. Here's how you open your first online brokerage account. Once your parents agree to opening a custodial account for you, the next step is to pick a brokerage firm. Online brokerage firms are perfect for first-time investors looking to buy stocks & ETFs because they typically charge have lower minimum balance requirements and commissions. We highly, highly recommend that you read our our explanation of online brokerage fees here. If you have time, check out this helpful article as well. There are 3 factors for a young investor to consider when choosing an online broker: (1) the cost of trading with a given broker, (2) the amount of educational resources that the broker offers and (3) the quality of the mobile & desktop trading tools that the broker makes available. As you become a more experienced trader, you will also have to consider the types of assets you want to trade, since some online brokers also allow you to trade mutual fund shares, futures and forex (in addition to stocks). But since this is your first foray into trading, we are going to suggest that you stick to stocks and ETFs for now. You want an online broker with low trading costs, lots of educational resources and a great mobile/desktop trading platform. However, you'll often find that online brokers excel in one area and neglect others. For example, Scottrade is great for trading stocks cheaply, but good luck using their mobile app. Keep in mind, though, that a shiny new mobile application is probably (definitely) the least important of all criteria when it comes to choosing an online broker (plus, Scottrade has a great desktop trading platform). For the relatively lower price of trading, Scottrade is still a great value. No broker is going to be a small dunk in all three areas. You are going to have to weigh the pros and cons of each broker according to your needs, and thats where we come in. Remember when we said that no broker in all three categories? Well, ShareBuilder comes close. At $6.95 per trade, ShareBuilder is right there with Scottrade in terms of affordability (both online brokers offer have the lowest cost per trade among the major online brokers, next to discount brokers like OptionsHouse and Interactive Brokers...we will discuss discount bikers in a bit). Furthermore, while most online brokers require that you initially deposit anywhere from $500 to $2500 to open an account, ShareBuilder does not. ShareBuilder's Knowledge Center is a great educational tool for young traders. Their mobile app lets you trade stocks, ETFs and options on the go while providing detailed stock quotes. TDAmeritrade is the only other major online broker (besides ShareBuilder) that doesn't require a minimum balance to open an account. However, TDAmeritrade is more expensive on a per-trade basis (each trade costs $9.99). TDAmeritrade offers the some of the best mobile/web trading platforms, and is the #1 choice for low-frequency traders who appreciate intuitive tools that allow them to monitor their accounts on the go. TDAmeritrade also offers the most comprehensive research and market commentary. The only other online broker that offers better trading platforms that TDAmeritrade is E*Trade. However, E*Trade has two drawbacks. The first is that it the minimum required deposit to open an E*Trade account is $500. The second is that E*Trade doesn't offer virtual trading. With virtual trading you can trade without purchasing actual stock (you get virtual shares that you can monitor). This is a handy tool for traders who want to test out trading strategies and is especially useful for young investors who are new to trading. Virtual trading is a common feature on most online broker trading platforms, including TDAmeritrade's. OptionsXpress is cheaper for trading options and futures then it is for trading stocks (they charge a $9 per trade fee for stocks). Still, they have no minimum required balance and a recently updated mobile application, making OptionsXpress an attractive alternative. OptionsXpress really excels in the educational resources department. They have webinars, articles and newsletters that are great for both beginners and experienced investors. They also have a useful virtual trading platform that allows you to practice trading $25,000 worth of a stocks (or whatever assets you choose). This allows you to practice trading while you are becoming familiar with the OptionsXpress platform. 13-Year-Old Owner of Freetoes, Inc. Who Takes Her Philanthropic Activities Seriously. Teen entrepreneurs and innovators are increasingly motivated by social concerns. This dramatically contradicts the stereotype of selfish youth. “30 years ago, the primary motivation for teen-led businesses was often solely to make money. Now most of the teen entrepreneurs and inventors we encounter are also motivated by the desire to help solve societal problems, in their own way,” said Emmanuel Modu, co-author of TeenVestor: The Practical Investment Guide for Teens and Their Parents and The Lemonade Stand: A Guide To Encouraging The Entrepreneur In Your Child. Theories abound about the reasons for the increased number of socially conscious teen entrepreneurs and innovators. Is it because the internet has made information about social issues more accessible? Is it due to the Great Recession of 2008, which may have negatively impacted young teens’ lives and spurred them to improve the lives of others? Regardless of the reason, the trend is real. A trio of 16-year-old girls —Ciara Judge, Émer Hickey and Sophie Healy-Thow— from Cork County (Ireland) won the Google Science Fair Prize for proposing the use of a naturally growing strain of bacteria to increase crop yield by 30%. Concerned about mass shootings in his home state, Kai Kloepfer, a high school student from Boulder, Colorado (US), invented a smart gun that unlocks with fingerprint authentication. A group of teen siblings —Ima, Caleb, and Asha Christian— from Decatur, Georgia (US), helped create a "Yelp For Cops" to rate both positive and negative police interactions with citizens. 13-year-old Katelyn Lohr from Vancouver, British Columbia (Canada) is owner of Freetoes Brand, Inc., which sells toe-less socks in major consumer outlets such as Toys “R” Us; she is very committed to her philanthropic outreach. 18-year-old Tom Osborne from Nairobi (Kenya), upon seeing what deforestation has done to his community, embarked on a clean energy project to produce smokeless charcoal briquettes and distribute cook-clean stoves throughout Kenya. 15-year-old Kenneth Shinozuka, of Irvine, California (US), invented a device implanted in socks that alerts caregivers when Alzheimer’s patients wander off unaccompanied. Teen Myla Swallow, from Sydney (Australia), and founder of the Clean Water Initiative, designed an inexpensive system to sterilize stainless steel baby bottles using a billy can and a simple pump-filter to produce steam. A young Maker tinkers with a microcontroller. We here at TeenBusiness have been keeping an eye on the maker movement recently. While there are incredible new opportunities for young inventors to take part in exciting new Maker projects around the country and across the globe, your first question might me: what is the Maker movement and why do I care? 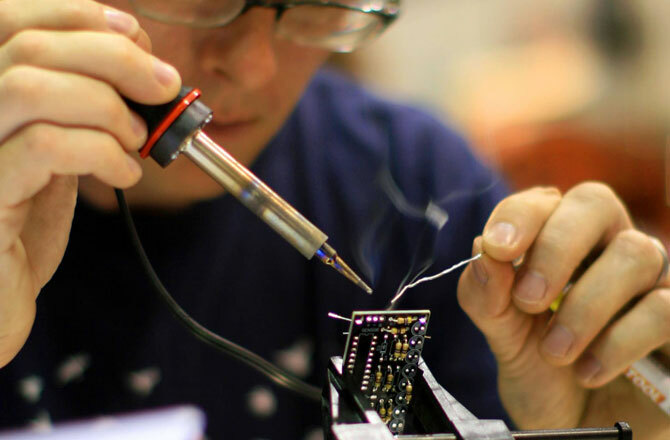 Some may tell you that the Maker movement is a Do-It-Yourself (DIY) initiative. And if you frame it that way, there is nothing new about Maker culture. Hobbyists have been tinkering away in their basements for centuries, creating inventions out of wood, metal and circuit boards. However, the Maker movement is much more than a DIY initiative. While the Maker movement is comprised of individual hobbyists and creators, the movement gets its strength from the social connections that it fosters and from the remarkable decrease in price of new tools. So he sold his laptop on eBay, added to those proceeds all of the birthday money and allowance he had saved over the years, and took out a loan from the Bank of Dad to buy the cheapest 3-D printer he could find online. By the end of seventh grade, he had paid his father back entirely—all from the sales of his customized iPhone cases and little cone toys that he’d designed to flip around like benign butterfly knives. Even if Henry were the world’s greatest #TeenVestor (in which case, he would have probably spent a considerable amount of time on this website), the story above would have been impossible five to ten years ago. Tools such as 3-D printers, laser cutters and micro controllers were too expensive for the average hobbyist. Nowadawys there are great options for young inventors interested in getting their hands dirty. There’s the Arduino, an open source micro-controller that has been used to create 3D printers, robots, earthquake sensors, sewing machines, model helicopters, and so many more objects. There are desktop 3D printers that sell for under $750, like the XYZ Da Vinci 2.0 duo. There are also desktop milling machines - useful for cutting and shaving wood and plastic - for under $2000. Cheaper tools made the Maker movement possible. Maker Spaces and Maker Faires made the Maker movement fun. A Maker Space is exactly what the name suggests: a space for individuals to make things, together. Maker Spaces have their roots in Hackerspaces, places where programmers come together and use their skills to tackle issues and build new things. While many people think that advances in computer science come from fancy comp sci degrees, Hackerspaces have played an integral part in innovations in programming and computer science. The Homebrew Computer Club, an early hackerspace/hobbyist group in Silicon Valley, played an integral role in creating the first personal computers. Makerspaces expand on the concept of Hackerspaces to include anyone interested in making anything, not just computer software and hardware. First popularized by the creation of MAKE Magazine in 2005, a Makerspace is a community workshop or craft area for both hobbyists and professionals. A typical Makerspace contains tools for many types of crafts - such as physical computing, sewing, woodworking, metalworkings, milling, etc. - and offers classes for those interested in learning how to use them. Young Maker Program: The Young Makers program is "a community that brings together like-minded young people, experienced adult mentors, and fabrication facilities to help more kids make things". Bring your idea to a club (search the directory to find a club near you) and work with a mentor to make that idea a reality. If you can't find a club near you, round up some like-minded friends and start your own. For more information on starting a Young Maker club, read the Maker Club Playbook. For-Profit Maker Spaces: TechShop is a chain of Makerspaces that charge monthly membership fees and offer workshops classes. The monthly fees carry hefty price tag, but the classes that they offer are a bit more affordable. Classes include Arduino 101, Woodworking Basics and Metalworking 101. Whether you join a Young Makers club, start your own club, attend Techshop classes or start using your school's makers ace, you might eventually want to show the world what you've made. In that case, you should head to a Maker Faire near you. In addition to the flagship Maker Faires, there are independent and community-sponsored Mini-Maker Faires popping up everywhere. Check out this Maker Faire map to find one near you. While the Maker Faires and makerspaces are available to everyone, it might also be a great idea to use crowd funding to get the money to create your own makerspace. If you and your friends are interested in creating a makerspace, and can find some great adult mentors to guide you along as you build it, check out our upcoming article about how to leverage corwdfunding platforms like Kickstarter and Indiegogo. See our list of crowdfunding platforms. Stock Basics (Part 1) — What Is A Stock? A stock represents ownership in a company. Therefore, when you purchase stock, you become part owner of the company. The number of shares of a company's stock that you own generally indicates what portion of the company you own. For example, Walt Disney has sold 1.72 billion shares to the public. So if you owned ten shares of the company's stock, the percentage of the company you would own is .0000006% (10/1,720,000,000 = .0000006%). In general, companies sell stock to the public through a process called an Initial Public Offering (IPO) in order to get enough money to build their businesses. At the time of this writing, the biggest IPO in history was on September 20, 2014 when Alibaba Group Holdings (stock symbol: BABA) raised about $25 billion. Now, let's consider what a stock is not. When you purchase stock, you are investing in a company. This is very different from when you purchase a corporate bond in which you are lending money to a company. When you buy the stock of a com¬pany, there is no guarantee that you will get your money back or that your stock will go up in value. By contrast, when you purchase a corporate bond, you will be repaid unless the company goes bankrupt. Even if the company does go bankrupt, the company's lenders will get paid back first (with the proceeds of the sale of the company's assets) before the stockholders get a penny. Because those who own stock in a company take on more risk than those who lend money to the company, it's important that Teenvestors (see definition of Teenvestor) understand the basics of the stock market. • Common Stock. Owning common stock entitles you to a share of a company's profit if the company decides to distribute those earnings by paying dividends. Common stock¬holders can also vote to determine a company's leadership and they can get a piece of the company’s remaining value if it ever has to be sold due to bankruptcy. • Preferred Stock. Preferred stock generally pays a fixed rate of dividends. More important, the preferred stock dividends must be paid before common stockholders get their dividends. Because pre-ferred stockholders get fixed dividends, they are not entitled to a larger share of the profits if the company does extremely well. On the other hand, they are taking on less risk because, if the company does poorly, they still get paid dividends before the common stockholders. One of the ways investors classify companies is by size. The size of a com¬pany is important to investors because big companies are generally consid¬ered less risky (for example, safer) than tiny companies. This is because, as a rule of thumb, the value of the stock of a big company does not move up and down as quickly as the value of the stock of a small company. In addition, the profits of big companies generally don't grow or shrink as fast as the profits of small companies. Market caps are classified in four main categories: large-caps, mid-caps, small-caps, and micro-caps. We recommend that Teenvestors invest in large-cap and mid-cap stocks—at least for your first few stock purchases. For example, General Electric stock is considered a large-cap stock. At the time of this writing, the market cap of General Electric was about $262 billion. You can get information about stock prices, market capitalization, and other information about companies through these sites. The time value of money is a very important business concept. The application of this idea is what determines your parents' monthly mortgage, car loan payment, or installment loan payments. It also has an effect on the price of stocks. haven't thought about how it can affect your actions. Let's consider an example of how this idea can be applied. Suppose someone told you that you can have $100,000 today or you can have $105,000 a year from now (assuming you have no immediate need for the money). Which would you prefer? You cannot really answer this question until we supply you with one more piece of information: the interest you can earn in one year by putting the $100,000 in an alternate investment such as a bank account. You can easily answer the question if you know that you can put the $100,000 you'd receive today, in a bank account paying 10% yearly compound interest. Think about the choices again: receive $100,000 today or receive $105,000 one year from now. For those of you who would rather have the $105,000 one year from now, you would have cheated yourself out of $5,000. And here is how. If you collect $100,000 today, you can deposit it in the bank and earn 10% interest for the year, or $10,000 ( = 10% of $100,000), on that money. In one year, you would have a principal and interest total of $110,000. This is $5,000 more than you would get if you'd opted to receive $105,000 one year in the future. If we told you that you can have $100,000 today or $110,000 one year from now, both choices are equivalent because the extra $10,000 we would give you one year from now exactly equals the amount of money you can earn by investing $100,000 in the bank for one year. Therefore you should demand more that $110,000 a year from now in order to make out better in the deal. This time value of money idea means that if you have a choice of receiving money today or a year from now, the money you should expect a year from now (by investing the money you received today) should be higher than the money you are offered today. Turning the situation around a bit, suppose someone told you that you are eligible to receive $100,000 one year from now. At the same time, she asks you how much money you'd require today such that you'd give up the $100,000 money you can receive in a year? Once again, this would depend on how much you can earn by investing the money you would be getting today for one year. Let's go through the numbers. Remember the original question: how much cash would you require today such that you would forgo $100,000 one year from now? As you can see from the formula above, the answer is that you should require more than $90,909.09 today if you can invest the money you receive today at an investment that would earn you a 10% return. We can prove this. So if you received exactly $90,909.09 today, it would be exactly the same as receiving $100,000 one year from now if you could invest the money you received in a bank account earning 10% interest. However, if you receive anything more than $90,909.09, you will be better off taking the money today. Let's assume that you were offered $93,000 today (the Present Value) versus receiving $100,000 a year from now (the Future Value). The future value of the $93,000 would be as follows. So if you received exactly $93,000 today, you should take it instead of receiving $100,000 a year from now if you can earn 10% interest on the $93,000 because you will end up with $102,300 instead. Therefore, you should always take the deal if you receive any amount over $90,909.09 in the scenario we just described. Things get slightly more complicated if the investment period is multiple years versus our one-year example but we will save this for another time. Notorious TeenVestor turned Conman, Barry Minkow. By the time he was 16 years old, Barry Minkow had already started his own carpet–cleaning business, ZZZZ Best. By age 18, he was a flashy Ferrari–driving millionaire living in a big house in California’s San Fernando Valley. By his twenty–third birthday, he was serving a 25–year sentence in a federal prison for 57 counts of fraud and conspiracy for billing insurance customers for bogus carpet restoration work. While incarcerated, Minkow became involved in the Christian ministry, and upon his release in 1995 after having served approximately seven-and-a-half years in prison, he went to work at San Diego Community Bible Church (SDCBC). Barry seemed to embody the worst of the 1980s. He was arrogant, flashy, greedy and unscrupulous. Minkow started out his business like any other young entrepreneur. But when he found financing hard to secure for his overly ambitious business goals, he turned to loan sharks. He also fraudulently overcharged his credit–card customers for work he never did. The most incredible part of the Barry Minkow story is that he even managed to hoodwink jaded Wall Street investment bankers. By the time he was caught in 1987, Barry had swindled $100 million from investors and had used a good portion of this money to finance his lifestyle. Barry’s story did not end after his early release from prison for good behavior. In 1997, Minkow became the pastor at SDCBC and soon thereafter founded the Fraud Discovery Institute (FDI), a for-profit entity that allegedly was aimed at the detection and prevention of fraudulent business practices. Through the work of FDI, Minkow soon garnered national media attention as a fraud detection expert, and his turn-around story was profiled on ‘’60 Minutes’’ in August 2006. Yet even while working through FDI to detect fraud, Minkow was engaged in manipulating the stock prices of the companies he was investigating. Most prominently in 2009, Minkow released a report accusing major homebuilder Lennar of massive accounting irregularities and fraud. In the wake of this report, Lennar’s share price was sliced in half—from $11.57 a share to $6.55 a share. According to court records, unbeknownst to the public, Minkow shorted Lennar stock in advance of the issuance of his report. Based on these transactions, Minow was charged with conspiracy to commit securities fraud, and on March 30, 2009, he pled guilty in Miami to conspiring to manipulate Lennar’s share price, for which he was sentenced to serve five years in prison and to pay $583.5 million in restitution to Lennar. Though currently in prison, he was recently charged with stealing money from the SDBC congregation. As part of his guilty plea, Minkow admitted to a long list of improper conduct, including opening unauthorized bank accounts on behalf of the SDCBC, forging signatures on SDCBC checks, using funds drawn on legitimate church accounts for his personal benefit, and charging unauthorized personal expenses on church credit cards. In addition, Minkow confessed to diverting SDCBC member donations for his own benefit and embezzling money intended as church donations. In all, Minkow admitted stealing—and concealing from the IRS—at least $3 million from SDCBC’s parishioners and lenders. As described in court documents, Minkow’s conduct continued for over a decade. On April 28, 2014, he was sentenced to 5 more years in prison. I tell this story because I think you should be aware of what can happen when ambition and greed goes haywire. In addition, I want to point out to you that young entrepreneurs are also susceptible to the lure of the good life just like some of the stereotypical Wall Street tycoons you see on television. Yes, indeed, TeenVestors can be crooked, too. However, I also believe that they can be taught business ethics at an early age before problems manifest themselves. The lessons of course, begin at home. More on how parents can promote good business ethics will follow. The picture shows Teenvestor and owner of a dog shampoo company, A Boy and His Dog. His business was inspired by his dog. I was once advising a 16–year–old Teenvestor on how to run his baseball card business. Every two months, he would make a one–hour bus trip to Chicago to buy more cards for his business. When I asked him to calculate how much money it cost him to make this trip into the city, he came up with a figure of $10. When I asked him to include the cost of his meals and miscellaneous expenses during his trip, he increased his expense figure to $24. When I told him that he should include these expenses in pricing his cards, he protested. "I enjoy going into the city to buy new cards. I don’t see why I should charge my customers for this trip." When I asked him whether he would go into Chicago as frequently if he didn’t have a baseball card business, he said no. When I asked him whether he subtracted any of his travel expenses when calculating his net profit, he said no. I then said to him, "You are not making as much money in this business as you think you are." This young entrepreneur’s problem was simply that he did not consider all of his true expenses when figuring out the cost of each of his cards. Many young entrepreneurs make the same mistake. They forget that small expenses add up to big numbers and therefore should be included in the cost of their products of services. Some young entrepreneurs are also not aware that they should include the cost of their equipment in making their products or offering their services. Take a typical teenage business such as lawn mowing, for example. Many Teenvestors who start lawn mowing businesses use their family’s lawn mower. As with all other mechanical equipment, the more a lawn mower is used, the more likely it is to require servicing. If the youngsters mowing the lawns neglect to include the cost of periodic servicing of the mowers, then they are overestimating the profit figures in their businesses. The risk of stocks has a special name in the world of finance--beta. The simplified explanation of beta is that it tells you how the value of a stock moves up and down with an index like the S&P 500. You don't really have to know how it is calculated but knowing the beta for each stock gives you an idea of how risky it is. If a stock has a beta of 1, it means that its value moves up and down by the same percentage as a market index like the S&P 500 moves up and down. A stock that moves with this index is said to have the same risk as the market. For example, if the S&P 500 index has a value of 5,000 today and moves to 5,500 tomorrow, this represents a 10% increase. If the stock of company XYZ has a beta of 1, you would roughly expect its value to also increase by approximately 10%. A stock with a beta of 1 is not really considered risky when compared with the overall stock market. A stock with a beta of, say, 2 means that each time the S&P Index moves up by 10% or so, the stock of company XYZ moves up by 2 x 10% = 20%. It also means that this same stock can move down 20% in value as well. So in general, high beta stocks are riskier than low beta stocks. But some people like risk because, even though they can lose a lot of money, they can also win a lot if the market goes their way. You can find the beta of stocks through financial websites such as Finance.Yahoo.com. By entering a stock symbol, you will get data about the stock price, trading volume, and other market information. The two images below are the information about General Motors, and News Corporation (the company that owns Fox News and the Wall Street Journal). Note that the beta of General Motors is 1.78 while that of News Corporation is about 1.00.